I’ve noticed quite a bit of hype lately regarding big brass block upgrades for Floyd Rose style tremolos. The name most associated with these parts are Floyd Upgrades. There is talk of greater sustain, and fuller, richer tone as a result of a nice big block of solid bell brass replacing what is usually a pretty nasty looking thin piece of pot metal. 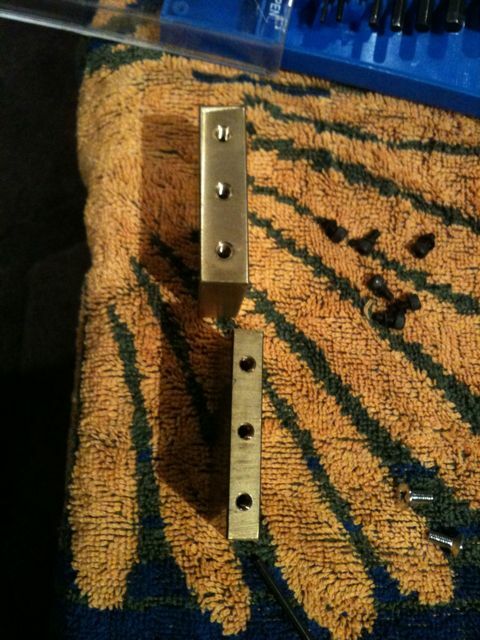 I was curious as to how much of a difference a large brass block would make on a Floyd Rose type bridge, especially a Gotoh unit, like I have in one of my guitars. The Gotoh licensed Floyd Rose bridges actually come with a fairly sizable brass block in the first place. I contact Adam at Floyd Upgrades to talk to him about his products, including the new Floyd Upgrades bridges that he is now selling. He graciously sent me a 42mm brass sustain block for Gotoh for me to test out for myself as a starting spot to see what his upgrades could do for my guitar. The Floyd Upgrades block is quite a bit thicker than the stock Gotoh block. Upon initial inspection the big block is definitely a nice solid high quality piece of brass. It is definitely thicker than any standard block found attached to a tremolo. I got onto installing the new big block (big block install DIY), and the following is my thoughts on the upgrade. I had read that quite a few people commenting that the big block upgrade made their bridge feel much heavier when using the whammy bar. I did not notice this too much myself. I am attributing that to the fact that most Floyd Rose type bridges use pot metal blocks which are probably a bit lighter than the stock brass block on the Gotoh bridges. The thicker block does limit your bridge’s dive and pull-up range a bit. I plan on taking a dremmel to my cavity and widening the cavity a bit where the block hits. It may not bother a lot of people though. One thing that would have been nice is if the Floyd Upgrades block came slotted like many stock blocks do to help keep the springs in place, and for Ibanez Edge type bridges, screw holes for the lock plate that Ibanez bridges typically come with. I’ve personally never had a problem with the springs coming loose on an Ibanez Edge tremolo unit I have that is missing one, but I know a lot of Ibanez guitar players have a concern over it. Sound-wise the Floyd Upgrades brass big block gave me a bit fuller and bigger sound than I originally had with the stock Gotoh unit. Sustain was also a little better too. When I recorded some samples to have a look at the waveforms I noticed that the stock Gotoh sample looked to be “louder” based on the decibel reading on my recording program, but the Floyd Upgrades sample “sounded” louder, even if the decibel reading was slightly lower. Looking at the waveforms I noticed that the Floyd Upgrades sample was more compressed, and that’s what I attributed to the higher volume when listening to the samples I recorded. I found the Floyd Upgrades brass sustain block provided me a small, but significant upgrade to my tone. Increase in sustain and fullness of tone was only fairly small, but it did provide a positive change. I think that due to the Gotoh bridge coming with a brass block in the first place that I was fairly spoilt with regards to my guitar’s stock tone. However, if you have most other types of Floyd Rose bridges on your guitar, which typically have a nasty tone sucking pot metal block I bet the Floyd Upgrades brass block upgrades would blow your mind. I have two Ibanez guitars with original Edge bridges which I think would benefit greatly from some Floyd Upgrades brass big block magic. I definitely plan to give them the upgrade in the near future. I will be sure to review them as well. Overall I think that the Floyd Upgrades brass sustain block upgrades are a very worthy upgrade for any Floyd Rose toting guitar. You will be impressed with the resulting fuller tone, and will enjoy having your guitar sustain more like a hard tail guitar. The limiting in the range of movement might seem like a deterrent to some, but it is not a difficult job to open up the cavity a little if you feel the need. Brass block upgrades are not especially expensive, so it’s definitely worth trying them out yourself. A big thanks to Adam Reiver from Floyd Upgrades for providing me with the brass sustain block for Gotoh.